So what does Farage do? Spends most of his time in Brussels, appoints useless sycophants, idiots and failed Tories and buys their loyalty by promising them an MEP seat. UKIP see just 9 councillors elected. A net gain of ZERO. Just 5% of the national vote. And yet the odious Paul Nuttall claims that he is "quite happy" with the result! UKIPPERS across the UK are still reeling from a disastrous election night. The calls for Farage to resign are getting louder as many UKIPPERS rightly blame him for a failure to deliver on his promises to "professionalize" the party and spend more time on building up local support. See Farage's election statement: LINK. We can confirm that certain senior members of UKIP are planning a meeting to discuss removing Farage at the earliest opportunity. UKIP suffered an humiliating result in London. Lawrence Webb - and it pains us to say it - came sixth with only 1.96 of the vote. He was over 900,000 votes behind Boris Johnson. He was beaten into sixth by the Tories, Labour, Greens, Lib Dems and an Independent. Only the BNP did worse. Another awful result. 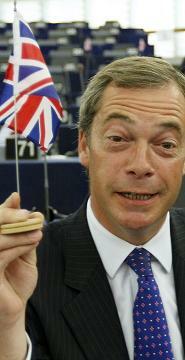 Farage and his sycophants had claimed that UKIP would win two seats on the Assembly. They didn't even come close! And yes, the Lib Dems beat them again! That will teach them to listen to polls! 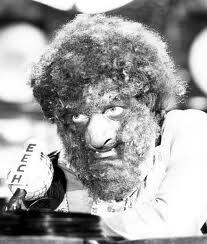 We note that Mick 'Wolfman' McGough suffered a particularly humiliating defeat in Brent and Harrow. He came last with just 5.4% of the vote. When will UKIP's leadership realise that this chump is a liability? UKIP suffered a string of humiliating defeats. The only managed to obtain an average 4.5% of the vote across the city. Compare this to pro-EU Labour who gained 41.1% of the vote. And the Greens and Lib Dems still managed to beat UKIP with an average 8.5% and 6.8% share of the vote. So much for that Fresh Choice for London! Another great idea from Nigel and his fools! And what does UKIP's leadership do? Blame an internal error for the bad result! 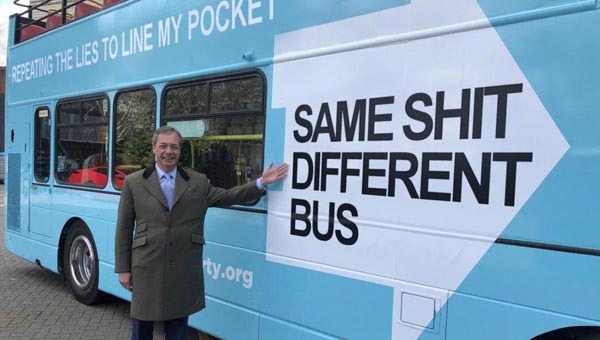 ...Party leader Nigel Farage said the bizarre blunder probably meant large numbers of would-be supporters assumed Ukip was not taking part in the ballot and gave their vote to someone else. ..."We can only put our hands up and say sorry to voters who wanted to back us but couldn't find our name on the ballot paper," said Mr Farage. UKIP came third with just 7.5% of the vote. Their candidate was over 17,000 votes behind the winning pro-EU Labour candidate. And yet the Farage apologists and sycophants are claiming that this is a "incredible result" for UKIP! There are none so blind! Newcastle-under-Lyme was once a UKIP stronghold. Not any longer! They lost two seats to pro-EU Labour. They took Holditch and Cross Heath from UKIP, who now have no seats in the borough. UKIP had high hopes in Plymouth. The city was a 'target' area for the party. They had hoped to win the balance of power in the city. Indeed, the leader of UKIP Plymouth declared that their "time has come". LINK. The result was somewhat different. Pro-EU Labour gained control of the city. UKIP's only councillor - a Tory defector - lost his seat. Another disaster! Pro-EU Labour took the St. James Ward from UKIP. Alf Doran, another Tory defector, lost his seat to pro-EU Labour in the Harington Ward. UKIP Scotland is an irrelevance. The membership could easily fit into a village hall. We note that Mike Scott-Hayward, UKIP's only Scottish councillor, lost his seat in Fife to pro-EU Labour. He was yet another Tory defector. It is interesting to note that these Tory defectors lose their seats once the voters are giving a chance to vote for them as UKIP candidates. We don't include Scotland's equivalent of UKIP parish councillors (community councillors) in our list of Scottish UKIP councillors. Community Councils are an irrevelance. Wikipedia confirms that such bodies are 'not usually viewed as a tier of government'. LINK. Other Scottish political parties don't even bother to list their community councillors. the number of "Comical Alis" emerging from the ranks of UKIP to desperately save their income stream as good little EUropeans is adding to the farce that surrounds the catastrophic failure of UKIP to live up to their huge spin before the elections! It was the F&CO who first formally identified the true problem of telling lies to the electorate when they identified that The EU would become increasingly unpopular as the truth dawned as to how the people had been misled. We note part of the "Comical Ali" spin to justify the abject failure to win seats was that UKIP came second in a number of seats - So what? The claim is that in the 1/3rd of the seats UKIP was able to find a candidate (many of whom were no more than paper candidates) and in the few seats they fought they did well doubling their vote - firstly, well it would be bigger they had more candidates and secondly during a period of massive austerity brought about by Labour's utter incompetence the Government was bound to be unpopular! Let us not forget Nigel Farage pointed out to the media that UKIP would benefit from a huge protest vote - true but clearly few voted for UKIP as most of their vote was as Farage pointed out, was protest! Much is made of the fact that UKIP doubled its vote in some areas - True but were it to double it again would they win more protest votes when largely the public protest by staying at home in disgust at the spin and deception of professional "Chemical Ali" politicians like UKIP. Had UKIP doubled its doubled vote would they have won more seats than the Greens who hugely out classed them in collecting protest votes or the LibDims who won 49 times as many seats as UKIP!!! Just remember UKIP's "Comical Alis" were declaring themselves as the third Party in British politics in the run up to their catastrophic placing as 9th. with just 9 seats out of 4,987 available! Many will remember how "Comical Ali" became a laughing stock with his loyal denial of any problems as we watched Baghdad being flattened in the background - Just like the idiotic spin from the crassly unprofessional and completely unfit for purpose corrupt and fiddling UKIP with its fascist like censorship of its own members and communist style denunciation abuse, lies and defamation of those who dare to speak the truth about their behaviour, their self serving self enrichment and their catastrophic incompetence as they squabble and back stab amongst eachother in faction teams to get PLACED on lists and enriched by their undemocratic dictatorial leaders. How sad when so many of us had such high hope of UKIP and even now support their members and their CLAIMED aims by publishing the truth - as with Junius, myself and others. UKIP's local election results were an unmitigated disaster and catastrophic - that is an undeniable fact. Further if they were to continue to grow at the rate they CLAIM it would be at least another 75 years before their unprofessional and clearly incompetent leadership clique and its claque would be of much relevance - other than as puppets for the pro EU left wing media to exploit!